Summer is over for most people, like those who have gone back to school, and my summer will be over after Labor Day when it’s time to report back to Memphis for another NBA season. I always get sad around this time because I’m leaving my family and having kids has made it even harder to leave! Although I am sad to leave my friends, family and the summer days, there is a small part of me looking forward to the next season in Memphis. With Memphis on my mind I decided to share my top 5 reasons I love Memphis. Running errands. There is such an ease about Memphis and traffic isn’t too bad. Of course I try to avoid the highway and Poplar Ave around 5:00pm but overall Memphis traffic isn’t bad. Now, I have lived in two different houses in Memphis and I could get to Kroger or Target in 5 minutes, even a Hobby Lobby. Every store you can think of seems to be conveniently located to where I am. Mild winters. Since I’m from Ohio and the majority of our winter is in the 20’s and often in the single digits I feel like Memphis winters are lovely. We get just a little snow here or there but it seems to rarely get below 32 degrees. Warmer winters do mean warmer summers but luckily I’m not in Memphis during the super hot summers! Small town feels. There are local businesses everywhere. I am a huge supporter of local businesses and Memphis has them all. From the coffee shops, clothing stores, cafe’s and fine dining. Another reason Memphis feels like a small town is because everyone knows the next person. I swear if it isn’t a relative then it’s through marriage. I love the connections everyone has and even though I’m a transplant I still feel I have a good amount of connection here and there due to what I’m involved in. Between Memphis Fashion Week, Bluff City Lights, Art on Fire and the Methodist Healthcare Foundation along with Myles’s story time at the library and swim lessons I have met a lot of friends. Memphis Grizzlies. I can’t not mention the Grizzlies (sorry for using the double negative). They are the reason I’m in Memphis. I love taking Myles to the games and he loves going. If we are lucky we get our goodnight hugs from daddy at halftime and hit the road during the 3rd quarter to get home for bedtime. Not quite sure how things will go now that little Noah is with us. This outfit is very casual and may not be blog worthy but I think it’s nice for me to share my everyday style as well. These shorts feel like total “mom” shorts which they shouldn’t but I think it’s because they are longer than what I’m used to. My other cutoffs shorts still don’t fit me, fingers crossed they will next summer. 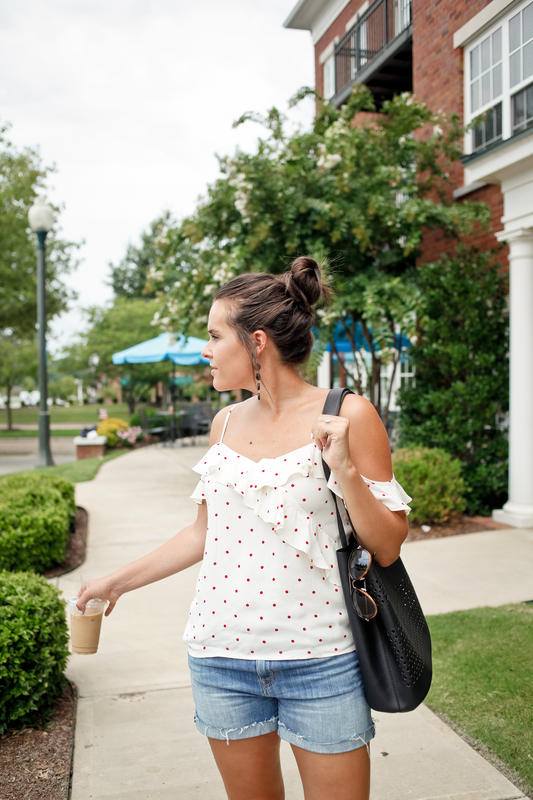 I had a hard time convincing myself to keep this polkadot top. The fabric is nice but it doesn’t stretch and it’s white so those are two things that aren’t kid friendly but I thought the top was super cute and I needed to think about myself. I’m finally starting to get out more without the kids so I can wear nicer clothes. 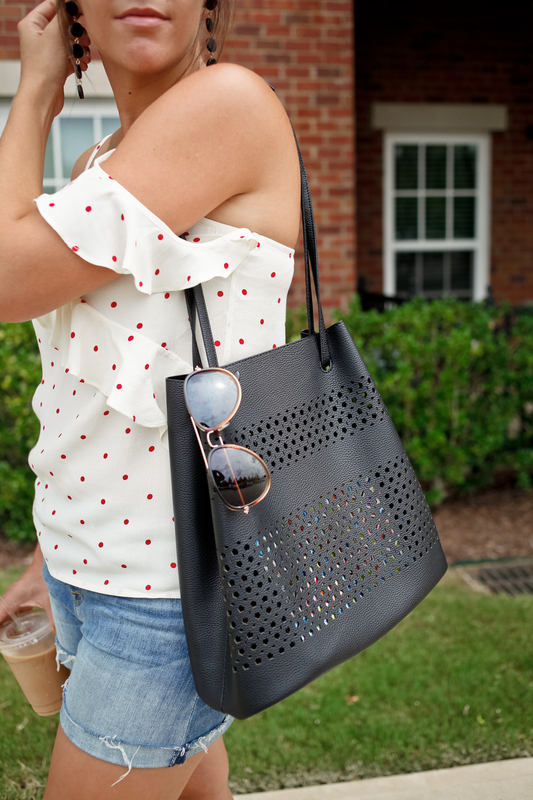 Usually when I’m out (sans children) I am off to a meeting so I need a large bag to toss my planner and a notebook in, this perforated one is perfect for fall, comes in brown and is under $40! My sandals I purchased the same time as my top and they match perfectly.